A Conservative Strategy is the Mandate - Richard C. Young & Co., Ltd. The value of the U.S. stock market has doubled from its March 2009 lows and has vaulted almost 30% since this past August. Fueling the bull stampede is the Fed’s continued ultra-accommodative monetary policy, improved economic momentum, a pre–presidential election year (the average stock-market return in year three of a presidential cycle is 17.5%), and investors’ rising risk appetite (flows into stock funds are on the rise). Wall Street strategists seem optimistic: recent average price targets for 2011 project that the S&P 500 will reach 1,400, an 11% gain. However, while 2011 is generally off to a good start, we remain cautious. For starters, the yield on the S&P 500 is 1.8%. In our view, such a low yield is an indication that stocks aren’t cheap. Today, we believe we are in the early stages of an upward trend in interest rates and inflation. The euro-debt crisis remains unresolved. Like U.S. policy makers, euro-area policy makers continue to kick the can down the road. China and other emerging markets also pose a risk to the global economy. There is much to worry about in China. There is a real-estate bubble in coastal cities that could derail growth, there is an overreliance on fixed-asset investment, and there is an emerging inflation problem. Inflation is also beginning to heat up in some of the other large emerging markets. Monetary policy will have to be tightened to prevent an inflation spiral. Tighter money in emerging markets could result in slower-than-expected global economic growth. So, while the stock market appears to be in friendly territory today, we have a variety of concerns as we look forward. Our general recommendation is to maintain a relatively conservative and balanced portfolio that emphasizes interest and dividend-paying securities. The heart of our Retirement Compounders equity portfolio is an emphasis on domestic and international dividend-paying stocks. In particular, we favor companies with pricing power and those that increase their dividends annually. A combination of pricing power and annual dividend increases is an often-overlooked defense against the potential nasty effects of inflation. Take Coca-Cola, by example. Coke’s consistent annual dividend hikes have helped the stock reach a new decade high. Coke’s dividend was increased to $1.76 in 2010 from $0.68 in 2000—a compound annual growth rate of 10%. Coke has increased its dividend annually for 48 consecutive years. Coke was established in 1886 and is the world’s largest beverage company today. Coke boasts a portfolio of nearly 500 brands, including 13 billion-dollar brands. The flagship Coca-Cola brand is naturally the most valuable of the 13 billion-dollar brands. Coca-Cola has topped Interbrand’s ranking of the world’s most valuable brands since 2001, when rankings began. Interbrand estimates the Coca-Cola brand is worth over $70 billion—an amount greater than the combined brand value of McDonald’s and Disney. While Coke’s headquarters are in Atlanta, the company is truly a multinational operation. Coca-Cola beverages are served to consumers in more than 200 countries at a rate of 1.6 billion servings per day. North America accounts for only 17% of operating income. Europe makes up another 29% of operating income, while the faster-growing regions of Asia, Latin America, and Africa account for 51% of operating income. It is in these faster-growing economies where Coke’s future growth potential resides. Consider the opportunities in the world’s two most populous nations. The combined population of China and India is over 2.4 billion. The annual per capita consumption of Coke products in India is 9, and in China it is 32. The annual per capita consumption of Coke products in the U.S. is 399, and in Mexico it is 665. Per capita consumption in China and India could increase tenfold and still not exceed per capita consumption in the U.S.
Of course, Coca-Cola’s success does not depend solely on emerging markets. Coke must also maintain relevance in more mature markets. Innovation is vital here. Products like Coke Zero, which was introduced only five years ago, can help Coke maintain market share in developed economies such as the U.S and Europe. Since its launch, Coke Zero has been the industry’s best-growing new brand, with double-digit sales growth each year. Since 2001, there have been 350 new sparkling beverages introduced to the market. Only six ever breached 1% market share. Only one, Coke Zero, has been able to maintain that milestone. 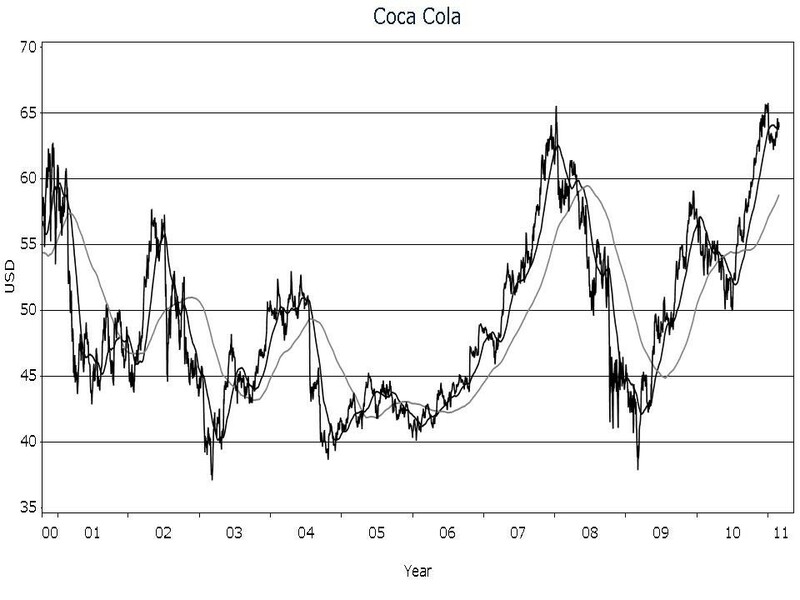 Owing to the rapid growth in its popularity, Coke Zero is on track to break into the top 10 most popular sparkling beverages in the U.S.
My long-term price chart shows Coca-Cola shares have recently broken out of a 10-year trading range. TC Pipelines (TCLP) is another favorite with a strong record of consecutive annual dividend increases. TCLP is a master limited partnership (MLP) that owns and operates interstate natural gas pipelines in the United States. It owns 50% of the Northern Border pipeline, measuring 1,249 miles long; 100% of the Tuscarora pipeline, measuring 240 miles long; and 46.45% of the Great Lakes pipeline, measuring 2,115 miles long. The three pipelines have a combined receipt capacity of 5.06 billion cubic feet of gas per day. TCLP also owns the 80-mile North Baja pipeline. The North Baja cuts across Arizona and through Southern California until it meets another pipeline at the Mexican border. Long term, we expect U.S. natural gas demand to increase. Natural gas is cleaner than coal, safer than nuclear, and much cheaper than oil on an energy-equivalent basis. And thanks to new drilling techniques and technologies that have unlocked vast stores of shale gas across the United States, natural gas can be produced in abundance domestically. Greater production and use of natural gas should increase the demand for natural gas infrastructure. According to the Interstate Natural Gas Association of America, the U.S. will need to boost pipeline capacity by as much as 20% to transport new natural gas supplies to growing markets. In our view, the economics of the pipeline business have appeal. The barriers to entry are high, demand is stable, maintenance capital spending is modest, and revenues are often inflation-adjusted. The frequent dividend increases and high yields of pipeline MLPs also don’t hurt. TCLP has increased its dividend in each of the last 10 years. Today the shares yield 5.6%. Like the pipeline business, the hydroelectric power industry also has favorable economics. Hydroelectric power plants are a conservative way to profit from a potential long-term secular increase in fossil fuel prices. How does hydro power benefit from higher fossil fuel prices? Let’s look at an example. Assume that natural-gas-fired power plants are the source of electricity with the highest marginal cost. If the price of natural gas rises, natural-gas-fired power plants would face higher costs. These greater costs would be passed on to consumers in the form of higher electricity prices. Since prices are set at the margin, the highest-cost kilowatt-hour sold sets the market rate. In our example, this would be electricity generated from natural gas power plants. When electricity prices increase, all power plants earn more revenue, but those powered by natural gas (and coal, since coal and gas are substitutes) would also face greater costs. Since hydroelectric power plants rely on water to generate electricity, their input costs don’t change when natural gas prices rise. Hydroelectric power plants get the upside of higher electricity prices when fossil fuel prices rise, without a corresponding increase in costs. Rising revenues and stable costs of course lead to greater profitability. We own two high-yielding Canadian hydroelectric power companies, Brookfield Renewable Power Fund and Innergex. Established in 1999, the Brookfield Renewable Power Fund is a Canadian income trust (with plans to convert to a corporation in 2011). The company is Canada’s largest publicly traded renewable power firm and one of the largest power income funds in North America, with 1,652 megawatts of installed capacity and average annual production of 6,382 gigawatt-hours. As its name implies, Brookfield Renewable Power Fund owns renewable power assets. The company’s assets consist predominately of hydroelectric plants and wind farms. Almost 90% of Brookfield’s installed capacity is hydroelectric. The company owns 6 facilities in Quebec, 18 in Ontario, 3 in British Columbia, and 15 in New England. Hydroelectric power plants are some of the most attractive power-generation assets investors can acquire. There are few moving parts and no high-heat combustion to worry about. As a result, hydroelectric power plants have long lives, low maintenance requirements, and strong reliability. Hydro plants also have some of the lowest operating costs in the industry. The U.S. Energy Information Administration estimates that the total operating expenses of a hydroelectric power plant are 84% cheaper than a coal- or natural-gas-fired power plant. Brookfield Renewable Power Fund sells the electricity it generates under long-term, fixed-price purchase agreements with partial-inflation escalation clauses to utilities, industrial companies, and Brookfield Renewable Power Inc., a wholly owned subsidiary of Brookfield Asset Management. Brookfield Renewable Inc. guarantees all of Brookfield Renewable Power Fund’s purchase agreements with industrial companies and itself. Renewable Inc. owns 50% of the Renewable Fund. Renewable Inc. has been in business for more than 100 years. The company is a highly experienced owner and operator of renewable energy facilities. In 2009, Renewable Inc. was Renewable Fund’s largest customer, accounting for 66% of revenues. Renewable Inc. maintains a strong balance sheet and is rated BBB by S&P. In the event Renewable Inc. were to run into financial difficulties, Brookfield Renewable Power Fund could always find another wholesaler to sell its electricity, but the fixed purchase price agreements would be voided. The trade-off for the purchase-agreement guarantees that Renewable Inc. provides to Brookfield Renewable Power Fund is that it gives up some of the potential upside from rising electricity costs. Brookfield Renewable Power Fund aims to distribute 80% of profits as dividends, and for a 2% long-term dividend growth rate. The shares currently yield 6.1%. The other Canadian hydroelectric power producer we own for clients is Innergex. Innergex is a leading developer, owner, and operator of run-of-river hydroelectric facilities and wind energy projects in North America. In its current form, Innergex Renewable Energy Inc. was formed in March of this year via a merger between Innergex Power Income Fund and the old Innergex Renewable Energy. Innergex Power Income Fund was an owner of hydroelectric power-generating facilities and wind farms. The old Innergex Renewable Energy was a developer, owner, and operator of hydroelectric and wind energy projects. Prior to the merger, the development and ownership of power-generating assets were split. The merger was structured as a reverse takeover so that the Innergex Power Income Fund could convert from a Canadian income trust to a corporation. Innergex owns a portfolio of projects including interests in 17 operating facilities with operating capacity of 326 megawatts and seven projects under development with capacity of 203 megawatts. Like Brookfield Renewable Power Fund, Innergex’s business is primarily concentrated in hydroelectric power. Innergex shares yield 5.9%. Three years ago, many were concerned about a second coming of the Great Depression. Those concerns seem to be gone in much of the media and Wall Street analysis. I guess they don’t make depressions like they used to. In our view, it’s not prudent to have a short memory regarding the recent financial meltdown. The Fed is flooding the financial landscape with liquidity, which can mask deep problems remaining in our economic system. A quick look at the real estate and unemployment picture should raise red flags about the issues still facing America. Until our economic and geopolitical outlook changes, we continue to favor a conservative and defensive portfolio featuring short-term corporate bonds, gold and currencies, and of course, a globally diversified mix of common equities that pay out a dividend year after year, along with regular dividend increases. Bond Bubble. Bonds performed so well in 2010 that some analysts have described today’s action in the bond market as a bubble. However, I am not ready to label the portfolio of bonds we manage as being in a bubble. The dot-com bust and the real estate collapse were examples of bubbles where some investors lost as much as 50% or more on their investment. A majority of the bonds we hold have an overall duration of 2. Duration is a measure of a bond or a bond fund’s sensitivity to interest rate changes. The shorter the duration, the less a bond will decline in price as interest rates rise. You can estimate the percentage change in the price of a bond based on its duration. By example, a bond with a duration of 2 can be expected to decline in price by approximately 2% for every 100-basis-point increase in interest rates. If interest rates begin to soar, it’s the longer end of the bond market that will feel the most pain. Muni Concerns. One of our primary concerns regarding municipal bonds is the potential for panic selling. According to Barron’s, 70% of the investor base in muni bonds is individual investors. The investors who own these bonds do not tend to analyze muni bond credits full-time. If muni defaults start to pile up, many investors are likely to panic-sell as we witnessed with preferred securities during the financial crisis. And with long muni rates still below 5%, it could be a long way down before value buyers step in to stabilize prices. Today we continue to avoid the municipal bond market. Performance Cycles. To help hedge against a declining dollar, we own positions in CurrencyShares Swiss Franc (FXF) and SPDR Gold Shares (GLD). Both had nice returns last year, with FXF up 10.5% and GLD up 29%. YTD, both positions have gained a little, while the NASDAQ is up nearly 5%. Despite the divergence in performance, we continue to favor the defensive characteristics of FXF and GLD. And while the NASDAQ is on a nice charge, it’s wise to remember that the index is still down 30% since December 31, 1999.